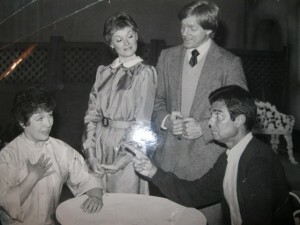 Performances at The Dock Street Theatre are held on Church Street at the original stage location on Queen Street – a confusing past with which I have a personal history. 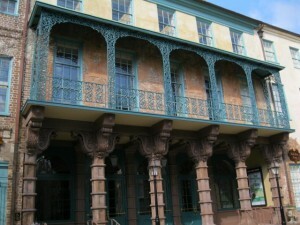 The first American structure built for theatrical performances was opened in 1736 on a street originally known for its shipping docks, but two years before, the city had flattered King George II by redubbing the street in honor of his expecting wife Anne, but the theatre continued to be called by the old street name. The term Dock Street lived on, but the building was short-lived, destroyed by fire in 1754. Rebuilt and damaged by fire again, the property was sold in 1809 as part of The Planter’s Hotel, whose entrance was around the corner on Church Street, but did include a small stage in keeping with other city taverns and public dining rooms of that era that often featured itinerant actors, singers and acrobats. The hotel was refurbished during the mid 19th century with distinctive ribbed brownstone columns and an intricate second-floor balcony, on which Charleston horse-racing jet-set were known to gather after events for libations that local legend says included a concoction called Planters Punch. With a fading post-Civil War economy and more modern hotel competition, the old structure entered the 20th century like many faded Charleston landmarks – dilapidated and ripe for demolition. A plan to revive the long-vanished theater would bring salvation in the form of a federal grant from the depression-era New Deal program, and in 1937, a The Dock Street Theatre reopened with a performance of The Recruiting Officer – the same play performed when the theatre first raised its curtains in 1736. The new theatre has performed far better than its original namesake, as home to local stage companies and host to musical and theatrical events for more than a century. First of these community companies was the Footlight Players, and as a “footlight” I played leading roles in five plays on the Dock Street stage, incuding this picture from “The Match Maker”. That’s me in the upper right, flanked by from left to right, Kit Lyons, Jo Anne Marcell, and Oliver Bowman. The famous Sword Gates at 32 Legare Street offer one historic case in which misinterpretation of the English language proved to be Charleston’s blessing. In 1838, city authorities commissioned German-born ironsmith Christopher Werner to create a “pair of gates” for the old Guard House at the corner of Meeting and Broad streets. Werner apparently assumed that meant two separate gates, rather than two halves of the same gate. He diligently went to work with his apprentices, pounding out an incredibly detailed pair of wrought iron masterpieces that featured two large swords facing inward horizontally on either side, as well as spears pointing vertically on either side. Both motifs were old Roman symbols of strength and power, well-suited for the Guard House, which was home to the city police. Upon presentation to the city, Werner was informed that there was only need for one set of “gates”, not two separate ones. One set was mounted at the entrance to the Guard House, and the other was put up for sale. Merchant George Hopley bought the extra gates for his home on Legare Street, replacing a large wooden gate that dated to the early 19th century, when Madame Talvande kept the house as an academy for young girls from elite families. 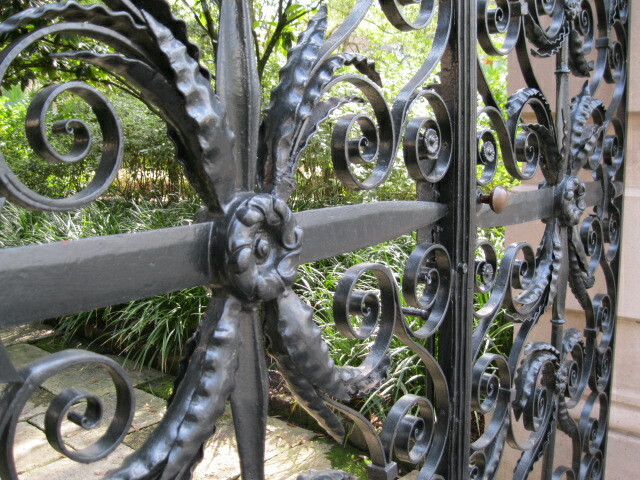 Hopley’s gates survive today as the most photographed and famed set of gates in a city renowned for wrought iron, and no doubt add significantly to the $23 million price tag on 32 Legare today. 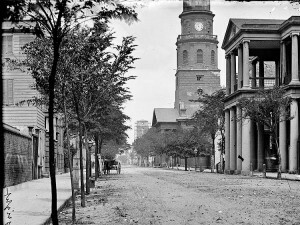 The original Guard House gates were removed from the Broad Street location after the building was severely damaged in the earthquake of 1886 that wrecked much of old Charleston. 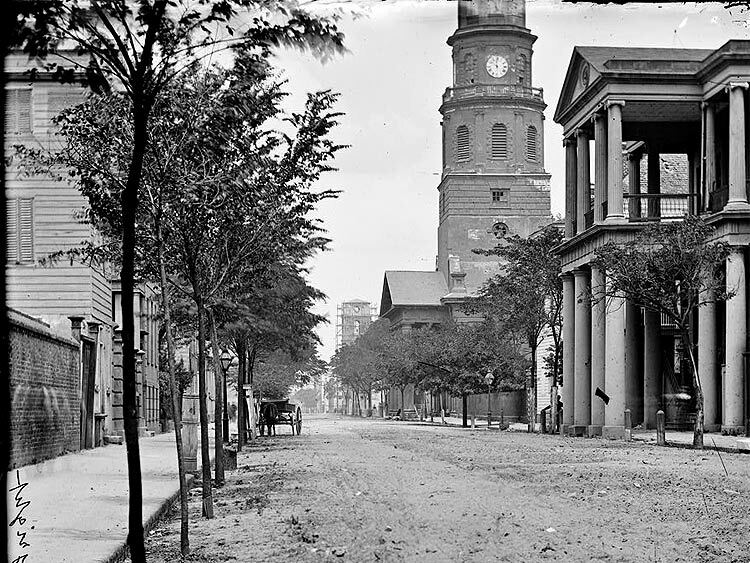 The police were moved to the Central Station on Hutson street in 1887, and the gates were put in storage, eventually to be remounted at the Citadel, when the military academy moved from Marion Square to its present site along the Ashley River. Today, those gates, painted gold, flank the entrance to the campus, but are not as imposing because they are separated by the street entrance. As it turns out, the unwanted extra gates are by far the most noticed and famous today, all thanks to a slight misunderstanding in 1838. The gleaming Spire of St. Michael’s Episcopal Church stands as a great testimonial to Charleston’s ability to survive disaster. The belfry on the 1761 church was used for many years as a fire lookout. A “steepleman” was posted in the open arcaded area, and if he saw evidence of a fire, would go down the narrow stairs to the “ringing room” and pull eight strokes on a rope attached to the largest bell above. This 1900-pound bell could be heard throughout the old city, and firemen on the old “engine companies” were trained to listen for the signal. From almost any vantage point, they could have seen St. Michael’s steeple, and the steepleman’s next job was to climb back up to the arcade, light a lantern, and hang it on a pole pointing in the direction of the fire. This method was used until the city put up separate fire bell towers in the 1880’s as part of Charleston’s first municipal fire department. S. Michael’s steeple was also used during wars as a military look-out, manned by local soldiers during the Revolution and War Between the States to observe besieging forces around Charleston. By 1863, Union troops on Morris Island were bombarding the city regularly with rifled cannons that could easily hit the glaring target that St. Michael;s made, so the city painted church and steeple a slate gray so that it would blend in with the horizon from a distance. Since the bombardment in the 1860’s, the steeple survived direct hits during the earthquake of 1886, when it was supported with huge beams to prevent its collapse, and when a 1938 hurricane struck on ironically, St. Michael’s Day, Sept. 29th. As we approach the sesquicentennial of the firing on Fort Sumter and the remembrance of Charleston’s Confederate history, I’d like to clarify the popular names of famous Southern flags that are often confused. 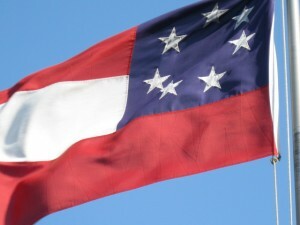 Many people have heard the name “Stars and Bars” and understandably associate that name with the famed Confederate banner that features the blue cross of St. Andrews on a red field, with white trim and white stars. In fact the “Stars and Bars” is the first national Confederate flag, created in March, 1861, featuring red and white “bars”, or stripes, and seven stars inside a blue field in the dexter corner. There were four versions of the Stars and Bars, representing differing numbers of stars for states in the Confederacy, or sympathizing with the Confederacy at different times during the War Between the States. The St. Andrews cross flag is the Confederate battle flag, which was first unfurled in November, 1861, as a soldier’s flag. 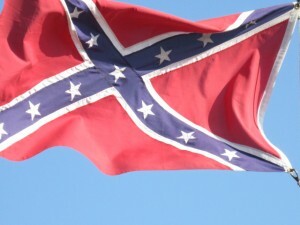 It was created to distinguish Confederates from Union troops, whose Stars and Stripes and Stars and Bars looked similar when hanging limp from a flag pole. Originally, the army battle flag was square, with navy blue in its cross, or saltire, and the rectangular version was actually first created as a naval jack for ships, with a brighter blue saltire. But the rectangular flag became popular among many infantry units, and what is commonly flown today has the navy blue cross. Among the many stories told about Charleston that have been greatly exaggerated over the years is the commonly misrepresented “compromise house” tale told of the property at 29 East Battery, the Porcher-Simonds house. In the first place, it should be pronounced as “Porshay”, and with a long “I” as “Seye-monds”. 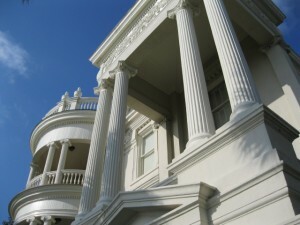 The hyphenated name for the house combines the surname of the man who had it built in 1856, Francis Porcher, and the owner who remodeled it in the 1890’s, John Simonds. The story that is often told is that the structure’s unusual combination of semi-circular and rectangular piazzas were created as a compromise between husband and wife over shapes they wanted when the house was being built. In fact, when the house was built by Porcher, a wealthy cotton broker, it was designed as a “side-hall” single-house, featuring a single living room wide facing the street, flanked by an open piazza on the south side piazza and an entrance hall on the north side. Original pictures of the house show that it looked very much like the side-hall house next door at 31 East Battery. Simonds, a wealthy banker, remodeled the house in Victorian style in the 1890’s, and the combination of circular and rectangular piazzas was a popular Italian Renaissance Revival style that can also be found at 68 Meeting Street, another antebellum single-house remodeled to look Victorian on the outside. Simonds, whose grandson and I play cards every week, was a determined businessmen who rarely compromised with anyone, so the story is entertaining but bogus. Since 1982, the house has been subdivided as three condominiums, but still has a wonderful look and a view of Charleston harbor that will never be compromised.